Escape From New York is my favorite John Carpenter film. There, I said it. While Halloween, The Thing, The Fog, and Prince of Darkness are each near-perfect cinematic experiences and excellent examples of one of our greatest filmmakers in his prime, Escape is simply John Carpenter at his best. The signature Dean Cundey camerawork from Halloween and The Fog is there, as is the manic and magnetic performance by Carpenter favorite Donald Pleasence, in his second of three collaborations with the director. The score is eerie, hypnotic, undeniably memorable, and unmistakably Carpenter (in association with his most frequent sonic collaborator Alan Howarth, of course). But Escape From New York really ascends by nailing the biting political commentary that would also come to define many of John Carpenter’s greatest works, more effectively than ever before and arguably ever since. Has there ever been a more poetically just story than the most wanted man in America being the only one bad enough to save the President from the hellish prison of his own making? The plot is brilliant in its simplicity. “I’m going in one way or another”, hisses our hero, and we can’t wait to follow him in. And then there’s Snake Plissken, the quintessential badass played to perfection by the ever talented Kurt Russell, in what he has called his favorite role, that which allowed him to escape his prior image as a Disney child actor and evolve into Hollywood’s newest leading man. Snake was America’s ultimate antihero long before being an antihero was the coolest thing on the planet, making Russell’s Clint Eastwood-inspired performance all that much more cool and unique upon Escape‘s initial theatrical release in 1981. Played by the great Isaac Hayes, The Duke of New York is cinema’s true O.G. villain, inspiring a decade of ’90s gansta rap videos featuring hot rides upgraded with The Duke’s costume hydrolics, and even sporting a memorable facial twitch reminiscent of the classic Bond villains. Lee Van Cleef simmers with old school swagger as the hardassed Hauk, unafraid to look Plissken square in the eye (even as Snake is choking him), hardened after numerous on screen scuffles with Eastwood himself over the years. The supporting cast is a killer lineup of Carpenter all stars, including Adrienne Barbeau (The Fog, Someone’s Watching Me), Tom Atkins (The Fog, Halloween III: Season of the Witch), Harry Dean Stanton (Christine), Nancy Stephens (Halloween, Halloween II) Charles Cyphers (Halloween, The Fog, Someone’s Watching Me, Elvis), and Frank Doubleday (Assault on Precinct 13), not to mention that the film was co-written by the original Michael Myers himself Nick Castle (Halloween), with longtime producer Debra Hill bringing them all together. To say that Escape From New York has gone on to inspire hundreds of films that have followed in its wake is a huge understatement. Look for a shot of a black helmeted helicopter pilot as he flies over Manhattan Island and tell me that’s not the exact shot used years later when the T 1000 is piloting a police copter in Terminator 2, directed by James Cameron, who not coincidentally got his start as a special effects designer on Escape. In recent years, Carpenter and his nightmare vision of a very believable future are finally receiving the recognition and respect they deserve, as no less than Entertainment Weekly even proclaimed John Carpenter as the most influential director of 2014, citing many of last year’s most obvious nods to Carpenter and even specifically to Escape, like The Purge: Anarchy, Cold in July, and The Guest, to name a few. Scream Factory’s new 2-disc Collector’s Edition Blu-ray release of John Carpenter’s Escape From New York presents this groundbreaking landmark film in a pristine new 2K high definition scan of the inter-positive, struck from the original negative, and Snake Plissken has never looked better. Cundey’s innovative lighting is on full display, as the crisp new transfer shows off the misty greens and deep reds that color this beautiful dystopia of destruction, with signature Carpenter style super-long shots, establishing place, character, and plot, while using the entire widescreen frame to create the otherworldly mood and unrelenting atmosphere of foreboding dread and danger. The fires down the alleys in the distance burn brighter and the strategically placed debris is more visible, as we follow Snake through this world of the damned that is part Mad Max and part Night of the Living Dead but with a far more recognizable landscape. In fact, watching terrorists crash the President’s plane into a New York City skyscraper can only evoke images of Sept. 11, 2001 when viewed today, and Plissken’s landing atop one of the World Trade Center’s Twin Towers is another scene that takes on new significance given America’s real life history in the years that followed the film’s release. The idea that terrorists could take over Air Force One is not at all far fetched or outside the realm of possibility in a post-911 world, cementing what was already a smart synopsis into a far more scarier scenario for today’s viewers. Scream Factory has packed a wealth of new bonus features into this release, including an informative featurette on the visual effects, a conversation with soundtrack co-composer Alan Howarth, an interview with set photographer Kim Gottlieb-Walker, a highly entertaining look back with actor Joe Unger of the original deleted opening scene (also included), and a chat with filmmaker David Decateau about his experiences working on Escape. There is also a new feature length commentary with Adrienne Barbeau, who played Maggie, discussing her memories of the film with director of photography Dean Cundey, who credits Carpenter’s vision for being so ahead of its time in even attempting to create a (seemingly large) whole different world on the tiny budget of an independent film. This new commentary is moderated by Sean Clark, who I have to thank for giving a huge shout out to Doubleday’s very creepy portrayal of The Duke’s henchman Romero, a character I too have been absolutely fascinated with since my earliest memory of watching the film. Romero is the first voice of the prisoners from inside New York, and he delivers with a sly and sometimes sinister performance that is unforgettable. Doubleday steals every scene he is in, which is a monumental achievement considering this amazing cast. Two additional feature commentaries, including a great conversation with Carpenter and Russell, are carried over from the prior DVD Special Edition release and also included in this new Blu-ray set, as well as the original opening bank robbery sequence, the Return to Escape from New York documentary, some very ahead of their time theatrical trailers, and two galleries of behind-the-scenes photos, posters, and lobby cards. The cool packaging includes a reversible cover featuring the original retro artwork on one side and the newly commissioned cover art on the other, inside a slipcover with the new art. This is a lovingly curated collection of behind-the-scenes anecdotes, candid images, and archival footage that will satisfy any fan, with enough material newly added for this release to easily warrant an upgrade for those of us that already own and cherish the 2-disc DVD Special Edition released in 2003, which itself was loaded with extras, all of which can also be found again on the new Blu-ray set, making this the ultimate Escape. 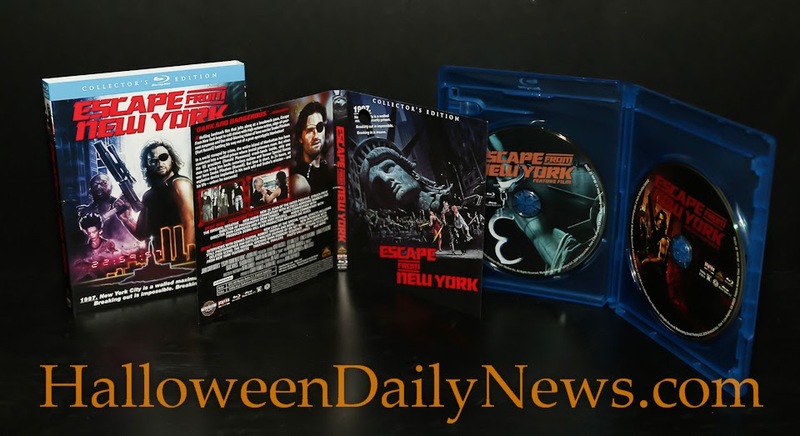 For fans of Snake Plissken and John Carpenter, Scream Factory’s 2-disc Collector’s Edition Blu-ray release of Escape From New York is definitely A Number One. John Carpenter’s Escape From New York Collector’s Edition Blu-ray will be released on April 21 from Scream Factory. You can pre-order yours now here!